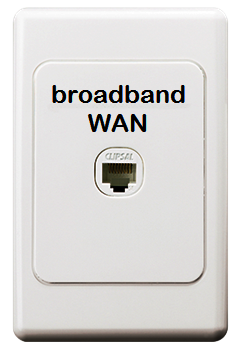 In some Residential Estates and some Apartment Buildings with their own wired internal network, the Vantage Broadband Internet Service will be delivered on a wall plate with an RJ45 type WAN connector. This is a so-called Wide Area Network (WAN) port, where you can connect your own home router/firewall/wi-fi box. The network WAN port provides a Dynamic Host Configuration Protocol (DHCP) service which will automatically tell to your connected router the WAN public IP address, the netmask, the gateway address and the DNS server address. This Ethernet WAN connection type does not require any PPPoE or PPPoA configurations. If you see that on the setup screen, disable it. Most routers require to be specially setup for Ethernet WAN. Some ADSL modems/routers can be setup for either ADSL or Ethernet WAN but not both. Some ADSL modems/routers can do both ADSL and Ethernet WAN simultaneously and can do automatic failover and/or load balancing. Some modems/routerscan add a 3G or 4G USB stick for automatic failover. Some modems cannot support Ethernet WAN at all. Please check your router manual for details. This wall plate with RJ45 WAN connector is the network boundary. Any problems up to that port will be looked after by Vantage Broadband assigned technical staff. Ring us if you need service, or open a service ticket on the Vantage Broadband website. Any equipment and cabling beyond the network boundary, including your own home router, home network cabling, home network swicthes, Wi-Fi boxes and other devices are your own responsibility. If you are comfortable with ICT equipment you can set them up by yourself, or if you need a bit of help you can hire Vantage Broadband staff for half a day or a full day to setup all of your home network devices (incuding smart phones, touch pads, laptops, streaming TV boxes, and the likes). For each of our serviced areas we will also publish the name and phone number of a nearby ICT specialist firm to assist you with any software or network issues that are beyond basic home networking, just in case you need that sort of assistance. You need to pay those firms yourself for their services. Some devices like routers and SIP phones can be purchased from Vantage Broadband together with your broadband subscription, or you can buy your own from an electronics shop or computer shop. There are plenty of different brands and models on offer. Each come with their own set of features and things it does and things it doesn't do. Please take some time to study the datasheets before you buy anything, just to make sure that your new box does what you want it to do. Or get advice from an ICT specialist.